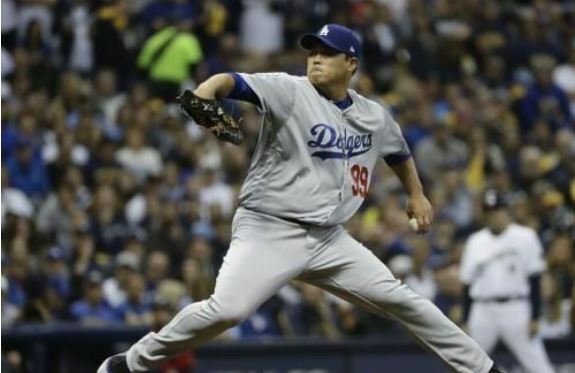 Los Angeles Dodgers' left-hander Ryu Hyun-jin will become the first South Korean to start a World Series game this week. LA manager Dave Roberts tapped ace Clayton Kershaw for the opening game, followed by Ryu in Game 2, beginning at 8:09 p.m.
(Eastern Time) on Wednesday, which will be 9:09 a.m. on Thursday in South Korea. This will be Ryu's fourth start of this postseason. He's gone 1-1 with a 4.40 ERA, with 15 strikeouts and two walks in 14 1/3 innings. He blanked the Atlanta Braves over seven innings as the surprise Game 1 starter in the National League Division Series on Oct. 4. But the left-hander struggled in two starts against the Milwaukee Brewers in the National League Championship Series. The Dodgers took a 3-2 series into Ryu's Game 6 start, but he couldn't pitch them to the World Series. He was hammered for seven hits, including four doubles, in three innings, and gave up five runs as the Dodgers lost 7-2. Both of his NLCS appearances came on the road. Given Ryu's struggles away from Dodger Stadium, Roberts was expected to hold him back for Game 3 at home and put the left-hander in a more comfortable setting. Ryu has never pitched at Fenway Park. He's faced the Red Sox once in LA, and that came on Aug. 24, 2013, during his rookie season. The Red Sox boasts two of the most dangerous right-handed bats -- or two of the most dangerous, period -- in American League MVP candidate Mookie Betts and Triple Crown threat J.D. Martinez.